Be the first to share your favorite memory, photo or story of Betty Jane. This memorial page is dedicated for family, friends and future generations to celebrate the life of their loved one. Betty Jane Suydam, 84, of Titusville, went to be with her Lord after a long battle with Alzheimer’s disease, on January 6, 2019 at her home with her husband by her side. The family is grateful to Betty’s home health aide, Josseline Michaud, for her loving and devoted care. Betty was born May 9, 1934 and grew up in Phillipsburg, NJ. She graduated from Phillipsburg High School and attended Churchman Business College. She was a resident of Titusville for 50 years. Betty was a proud homemaker and mother for many years. After her children were grown, Betty worked as a secretary at St. Matthew’s Episcopal Church, Corestates Bank, and Lenox. Later in life she attended and graduated from the Shadyrest Bible College. 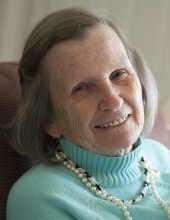 Betty was a loving and devoted wife, mother, and grandmother. She was an accomplished seamstress, a wonderful cook, and loved both studying the Bible and teaching Bible studies at her church. Betty is survived by her husband of 63 years, Larry Suydam. She is survived by her son Hank Suydam (and wife Laura), and daughters Dawn (and husband Tim) Clydesdale and Judy Hively (and husband Bob Boltner). She is also survived by her eight grandchildren, Adrienne Suydam, Frank Suydam, Corey Hively, Kim Suydam (and fiancée Tyler Revak), Heather (and husband Kevin) Barile, Matt Suydam, Jonah Clydesdale, and Grace Clydesdale. She was mother of the late Eddie Suydam. Family and friends may call on Saturday January 12, 2019 from 10:00 to 12:00 at the Blackwell Memorial Home, 21 N. Main St., Pennington, NJ, with a Christian funeral service to begin at 12 noon. Burial will be at Fairmount Cemetery, Phillipsburg, NJ, at the convenience of the family. To send flowers or a remembrance gift to the family of Betty Jane Suydam, please visit our Tribute Store. "Email Address" would like to share the life celebration of Betty Jane Suydam. Click on the "link" to go to share a favorite memory or leave a condolence message for the family.